Silver diamine fluoride (SDF) is an antimicrobial treatment used to slow down or halt tooth decay. The treatment harnesses the antimicrobial properties of silver and the remineralization ability of fluoride (which reverses teeth breakdown caused by bacteria) to make the teeth stronger and healthier. 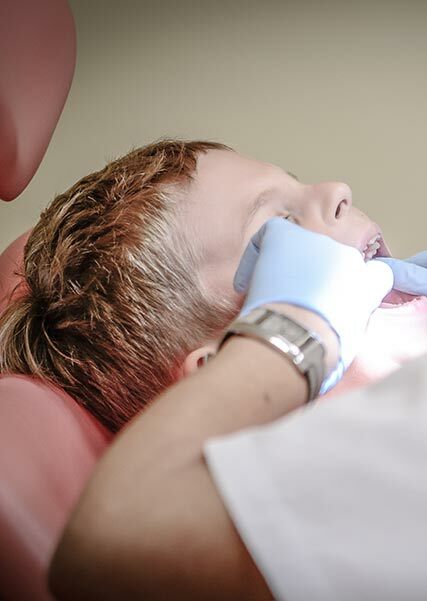 Fluoride treatments are typical during your child’s visit to the office, but this particular fluoride procedure is used in special cases when a child has tooth decay. Sometimes treating tooth decay by conventional methods, such as with a filling, can be difficult, especially if a child has trouble sitting still or has quite a bit of tooth decay. In cases like these, silver diamine fluoride is a great option for repairing the teeth with simple, non-invasive applications. Silver diamine fluoride has been used all over the world to treat tooth decay in patients of all ages. In Japan, it has been an option for patients for over 80 years, and is commonly used across many other continents, including Australia, Asia, South America and Europe. This product has been available in the U.S. since April of 2015, upon its approval by the FDA in August of 2014. Adverse reactions to the silver diamine fluoride are uncommon*. Your child may have some irritation on surrounding gum tissue after application, which is typical. The most well-known downside of using SDF, however, is that often stains the decayed parts of the teeth a dark brown or black. While the idea of staining may cause a certain amount of alarm, it’s important to note that healthy teeth will not stain, and since we generally only use SDF on baby teeth, stained teeth will eventually fall out and be replaced by health permanent teeth. *Of course, if your child is allergic to silver, SDF is not a treatment option that would be considered safe for them. Silver diamine fluoride is used to treat hypersensitivity and tooth decay, and is one of the most s effective methods for killing bacteria. The silver in the compound strengthens dental tissues to make them healthy again, and the fluoride both stops or “arrests” the decay and prevents future decay from appearing. To apply silver diamine fluoride, the area is brushed without toothpaste, and all debris, such as plaque, is removed. Once the area is dry, SDF is applied with a microbrush, and left on the teeth for a minute or two minutes before the excess is removed. After the treatment, the child should not eat or drink for an hour. To maximize effectiveness, silver diamine fluoride may require multiple applications or periodic reapplication. Prior to any treatment, Dr. Downey, Dr. Carolyn, or Dr. Ashley will discuss their recommendations for your child’s situation. Together, you will decide which route will best address your child’s needs and ensure they continue to have a healthy smile for years to come.